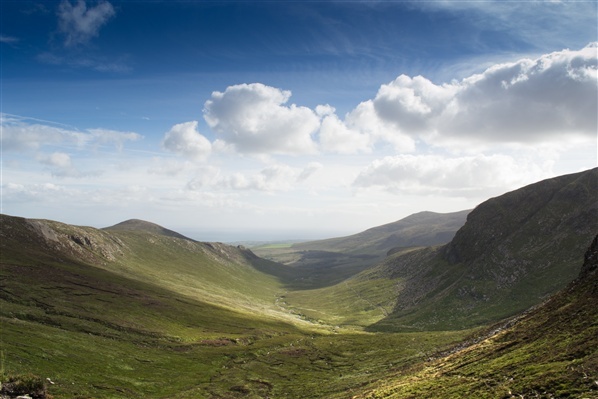 We asked Hikers Blog to put together some of their best shots from their walking in the Mourne Mountains and here’s what they came up with. I think you’ll agree the results are pretty impressive showing that sometimes a walkers view really is the best! 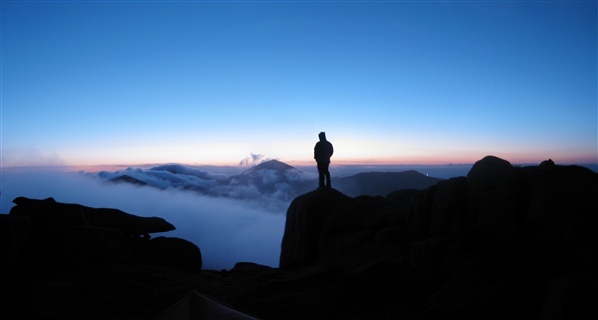 After a great camp I took this photo of my friend John standing silhouetted during a beautiful sunrise on Slieve Binnian . This photo was featured in a double page spread in Trail Magazine. I took this photo after a really enjoyable hike from Annalong Wood, up the valley into Newcastle. The weather was fantastic, with just the occasional light shower. The winding track, secluded rock pools and mountain views made it all truly memorable and the view near the end in the picture above made it worth every step. Slieve Lamagan is my favourite Mourne Mountain. 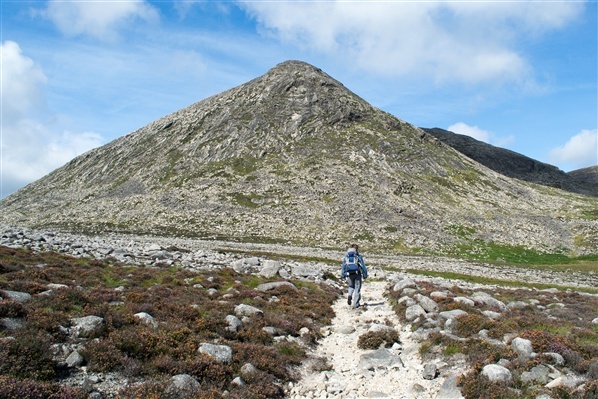 Its rocky character and steep profile are unique in the Mournes and it is a formidable climb which demands respect. My friend Dave is pictured walking the path towards Lamagan, absolutely dwarfed by its immensity and power. For me Lamagan has a unique appeal no other mountain can match. This photo was taken during the heavy snow in mid April this year. 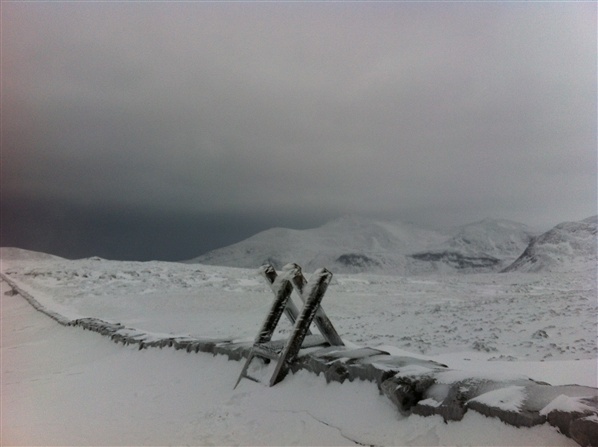 A friend, Eamonn stands on Slieve Bearnagh taking in the snow blanketed peaks of the Mournes, a rare and magical sight. Slieve Binnian is definitely my favourite Mountain and nothing captures why like this photo. My two friends Spud and Catriona are pictured on the path up Binnian as the sun rises behind them, casting a beautiful golden light right across the Mournes. In this occasion rising early was definitely worth it. Often in the mountains the dramatic views in the distance blind us to the beauty which lies beneath our feet. 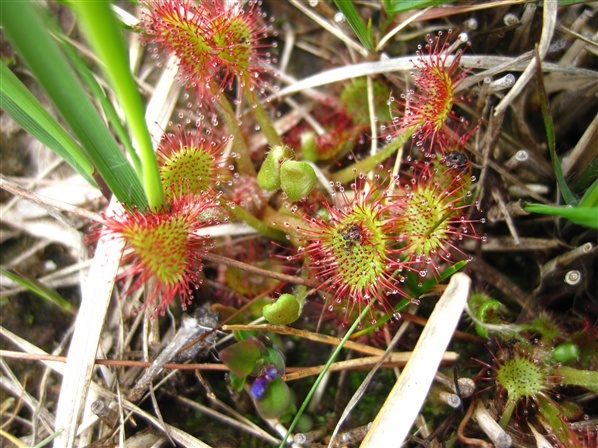 Take for example this beautiful Sundew, an insect eating plant with special appendages for catching its prey. 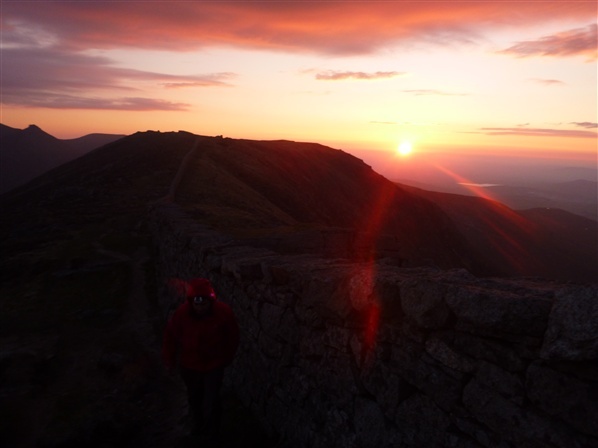 We had been walking all day, and it was getting late and we still had a brave distance to cover to complete the Mourne Wall Challenge. We were rushing to pick up the pace and keeping our heads down, when gradually the bright glare of the summer sun started to fade and was replaced with a soft orange glow bouncing off the land all around us. It brought with it a peaceful atmosphere, which made me stop and just stand there, as if trying to absorb the moment. This shot was taken on a bright crisp Sunday morning from eagle mountain in the western mournes, I love the fact you can see all the high mournes, gives a real sense of the scale of the mountains. This shot was taken on a very cold day from the stile at the bog of Donard, I like it because of the sense of frozen isolation, we were the only 2 people there at that time, and it really seemed like we had the frozen mountains to ourselves. If these fantastic shots have inspired you to get out and experience the views first hand then make sure to visit WalkNI.com for route descriptions, maps, transport and facility information for over 230 quality walks in Northern Ireland. 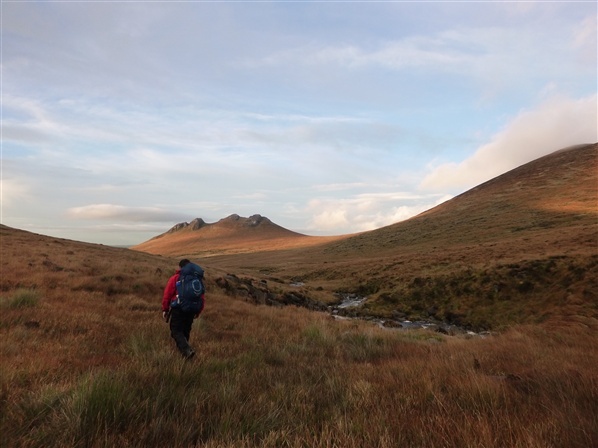 HikersBlog.co.uk is a blog run by a group of Irish hiking and camping enthusiasts who can often be found exploring the Mourne Mountains and further afield. Happiest when they are outdoors they document their adventures through trip reports, videos and photos as well as offering gear reviews. There are plenty of different ways to explore the beaches of Northern Ireland including strolling along the shoreline or delving into the sand dunes but another great way is by taking part in one of the many outdoor activities that use the beach as their playground. Blokarting - Blokarting combines aspects of dingy sailing and kite buggying, a landsailer is exactly what the name suggests – a three wheeled yacht (or kart) with a sail attached and is ideal for the beach given the wide open space you need. Blokart World is a company run by qualified trainers offering sessions on the following beaches – Benone, Murlough, Tyrella and Cranfield. Surfing – Surfing in Northern Ireland offers waves to suit everyone, from beginners to champions and if you’re kitted out with a good wetsuit it won’t be too cold to venture into the water. The surf scene is most definitely based on the North Coast with providers operating from 3 different beaches including Troggs Surf School on East Strand in Portrush, Alive Surf School on West Strand in Portrush and Long Line Surf School on Benone Beach. Stand up Paddle Boarding – Is a fun and easy way of riding a surf board with a paddle, SUP is a great way to have fun on the beach when the surf is flat. 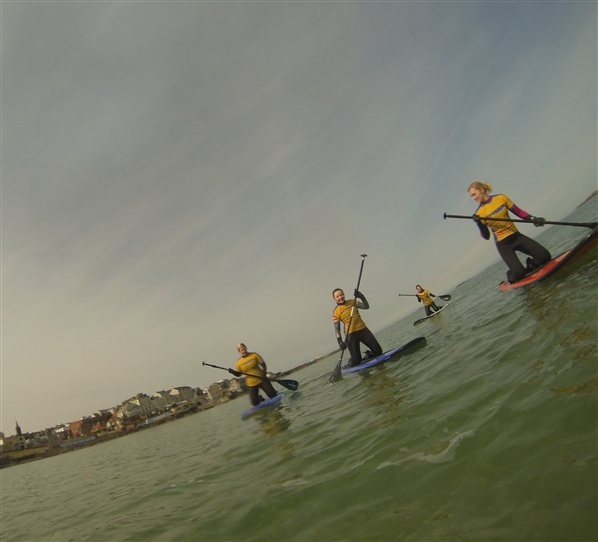 The SUP scene is growing rapidly in Northern Ireland and whether you want to enjoy a lesson or go exploring on a SUP safari - the use of modern wetsuits means that it is a year round sport. Providers operate from Benone Beach and East Strand in Portrush. Horse Riding – Horse riding on the beach is a fantastic way to experience being on horse back, although as the horses tend to want to go a bit faster in the wide open space, riding schools normally stipulate that you have to be an experienced rider to have a go. 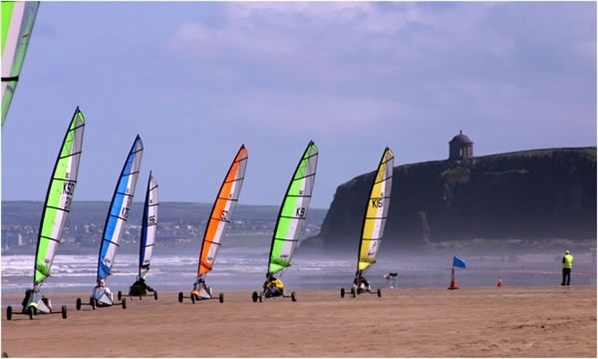 A favourite spot for beach riding is Downhill Beach in the shadow of the iconic Mussenden Temple with Hill Farm Riding Centre. Segway - Imagine a feeling like hovering above the ground at speed, with complete control over any terrain, this is what it feels like to ride a segway. 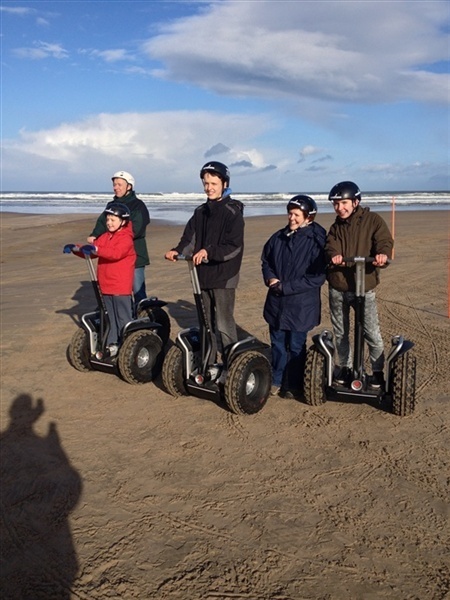 Segway Express, based on the outskirts of Limavady, offer tours on Benone Beach giving you the opportunity to glide along part of the 7 mile stretch of beach and test your skills on the boardwalk on the way back. Sea Kayaking – Experience what the North Coast has to offer to sea kayakers by taking a sea kayak trip from East Strand Beach in Portrush with provider Simply Sea Kayak. Launching from the beach, the tour will take you out to the impressive Skerries Islands to spot the large population of breeding seabirds before returning back to the beach. If this blog has inspired you to explore your nearest, or not so nearest, beach from a different perspective then don’t forget to visit BeachNI.com for even more activities to do on the beach. It’s that time of year again when we’re met with dark evenings and cold frosty mornings as well as the inevitable rain that comes along with every winter. At Chain Reaction Cycles we don’t view winter as a negative, more of a challenge to keep you on the road and trails. Two of our longest serving members of the team - Brendan Monaghan (road cycling specialist) and Stephen Prentice (mountain biking specialist) have pulled together their own winter essentials kit list which should help you whether you’re commuting to work, riding trails or heading out for a long road ride. For every road cyclist the key elements of winter cycling are to stay warm, dry and most importantly out on your bike for as long as possible. Generally my feet are the first to feel the signs of cold, so wearing a pair of Northwave Fahrenheit GTX boots (£121.49) has a large impact. Whilst definitely not the cheapest item on the list, they’re the number one item as far as I am concerned. To enhance that, why not look at a pair of Mavic Thermo socks for that added comfort? Then I look at the layering for the top half of my body – base layers help to keep me warm and wick moisture, the craft Active LS top (£28.99) is a great example of that: thin, lightweight and dries quickly. My outer layer on the colder days is the Northwave Extreme Graphic jacket (£107.99), warm, shower resistant and with plenty of stretch letting me move to suit my cycling style and position. For leggings, the Endura Thermolite Pro Biblong Padded tights (£71.89) with the Hi Vis sections gives other road users visibility of me and again the high stretch Lycra lets me perform whilst keeping me warm. My final essentials are my Castelli gloves (£34.99), my merino Buff (£19.99) and my SealSkinz waterproof cycling cap (£22.99)...all a must for the Northern Irish unpredictable winter. On a cold wet winter day it’s essential to wear the correct gear to give you the best riding experience for the conditions. To start off a good baselayer – my Helly Hansen Dry Revolution long sleeve (£44.99) will help keep the chill out while my Endura Windchill II softshell (£71.89) keeps the elements out. A Pair of Endura ¾ Humvee baggie shorts (£56.75) help keep me dry and warm whilst still allowing enough movement. Gaerne G Artix boots (£137.69) are probably my favourite piece of kit, keeping my feet warm and dry and they’re always reliable, great for muddy terrain and removable front studs for extra traction. My final essential is the Endura Luminite Glove (£31.21), with wind-block fabric…not expensive and ultimately lets you stay on the trails longer. Other good essentials for mountain biking are a good backpack like the Camelbak Mule (£71.99), a pair of knee pads from Nukeproof at £49.99, some winter socks from Endura, their BaaBaa Merino winter socks are priced at £9.45 and a Buff from Cyclone from £25.99. All Items are currently in store at our Belfast Flaship Store on the Boucher Road. Two of CRC Flagship Store's longest serving members are Brendan Monaghan and Stephen Prentice. Brendan is a keen road cyclist and knows everything there is to know about road cycling whilst Stephen prefers spending his time cycling off road and is a specialist in all things mountain biking. Summer maybe over but that doesn’t mean you have to put your bike back in the garage! 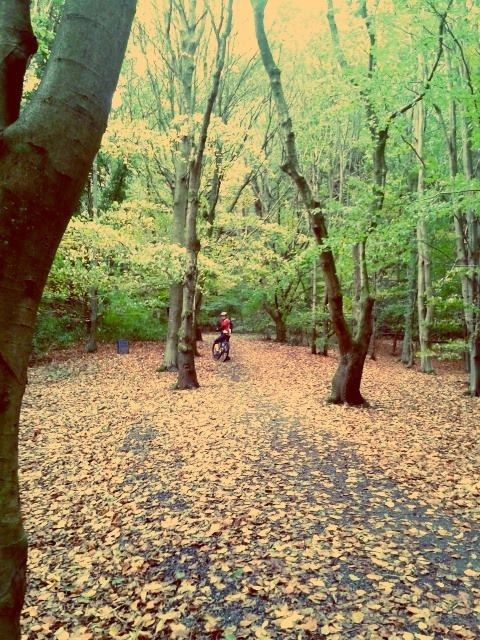 Some of the best cycling to be had is in the autumn time when the weather is cool but not too cold and the leaves around you turn from green to brown and start to fall to the ground. So why not put on another layer, get on your bike and check out these routes below, all are finished off with a good coffee stop suggestion! Lagan Towpath & Barnett Demesne Mountain Bike Trail – Cycle from Shaw’s Bridge along the green and blue trails of the new mountain bike trails, finishing off with a short cycle along the Lagan Towpath (total amount of cycling is around 5 miles) to the Lough Keepers Cottage for a well earned coffee and one of their gigantic tray bakes! 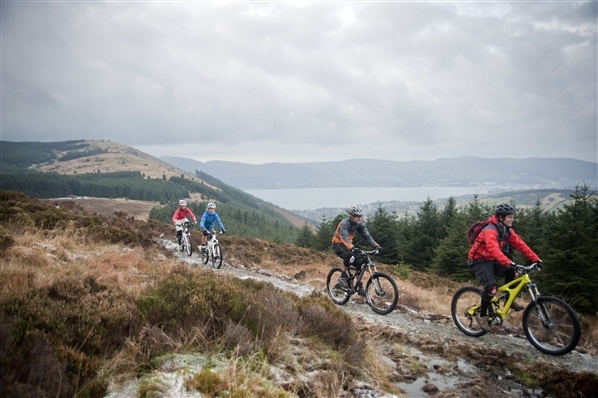 Newry to Slieve Gullion Courtyard – This 10 mile route starts in Newry and connects with the Newry Canal Cycle Trail. Once outside Newry it follows minor country roads passing by historic places, archaeological monuments and stunning scenery within the Ring of Gullion Area of Outstanding Natural Beauty. Once at Slieve Gullion be sure to call into the Grounded Coffee Shop in the courtyard to taste one of their many delights. Castle Ward Boundary Trail – The Castle Ward Boundary Trail is just over 8 miles in length and follows the boundary of the estate. It combines multi use trials with some swooping singletrack to get the fun going. After your bike ride relax with a cup of coffee or refuel with a bite to eat in the stableyard tea-room. Beech Hill – Enjoy up to 3 miles of cycling in the historic grounds of Beech Hill Country House Hotel exploring the connections the site has with World War II. Finish off the day with a visit to the Ardmore Restaurant located within the grounds of the hotel. 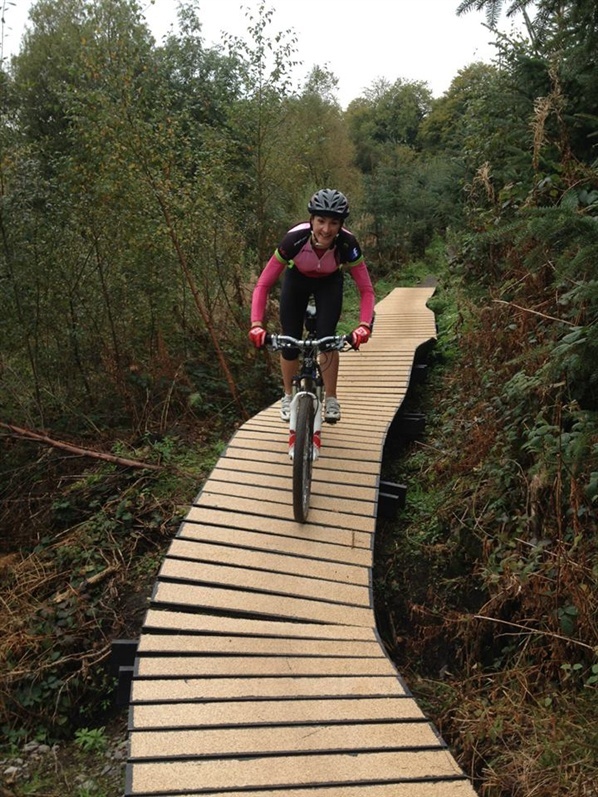 Crom Estate – Saddle up for this 3.5 mile trail at Crom Estate and discover one of Ireland's most important Nature Conservation areas passing through ancient oak woodland with views of Upper Lough Erne. Don’t miss the Crom Tea House, where it was once customary for the family of the estate to take refreshments. “Skinny Latte” At Blessingbourne Anyone? 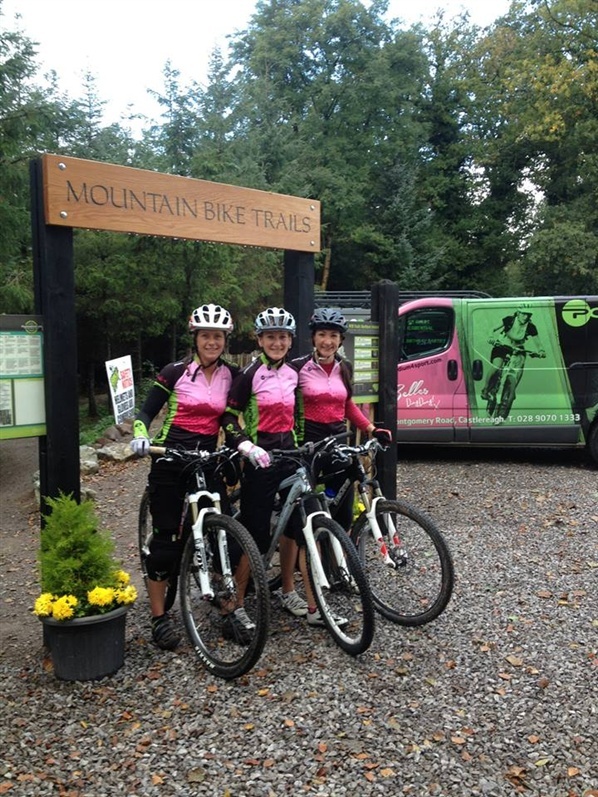 We were delighted to see The Belles down at the official launch of Blessingbourne Phase II a few weeks ago and even more delighted when Andrea offered to write an open and honest review of the new trails for our MountainBikeNI.com Blog. 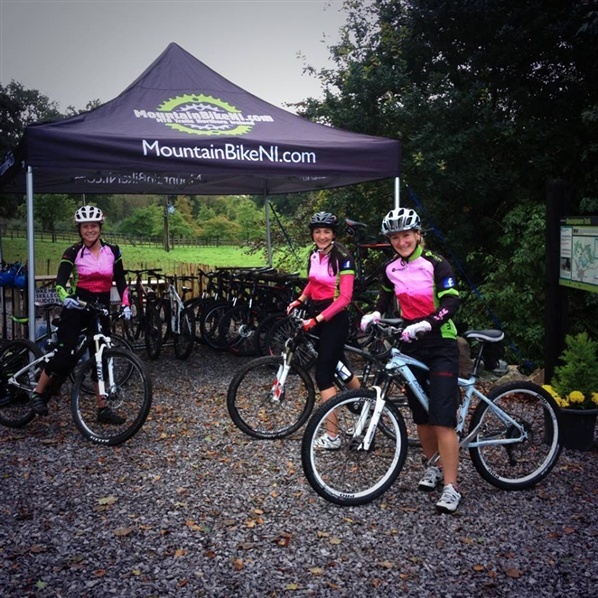 Now, since Blessingbourne opened its debut trails in June 2011, you have always been guaranteed a fantastically friendly pre / post ride coffee and chat, but now you can have a “Skinny Latte” of different sorts – given that is the name of one of the new trails on the extended network of routes. The new trails now mean that this wonderful estate boasts a pump track, 4km of blue trail and 8km of red trail – and the fabulous variety with the extended trail network certainly satisfies all levels of rider. The technical new additions include log rides, rock drops, table tops and berms – quite a few of which are not for the faint hearted, and certainly for the young at heart. Kids really do have no fear! Perhaps the new trails should come with a noise-ometer? The whoops of kids as they hit the new berms for the first time are a joy to be heard! Not to mention the whoops of the “big” kids as they over and over again bomb down “Berming Rubber”. Now who wouldn’t want a “Skinny Latte” shortly after “Berming Rubber”??!! One of the many remarkable things about Blessingbourne is that even without notable gradients, the extended trails certainly provide a real work out. Moreover, without being aware of gaining much height, there are a couple of extremely fast descending sections that give a real buzz! Blessingbourne’s most noteworthy feature is its ambience, at the heart of which is owners Colleen and Nick. Whether you’re there for a half-day, full day or an overnight break, the superb trail centre they have created provides a “getaway from it all” feel. The spins and downtime live long in the memory, perhaps every so often also having a visible reminder from one or two spills along the trails! What’s that saying? If you don’t fall off, you’re not trying hard enough? Either that, or you lost your balance on a log ride! 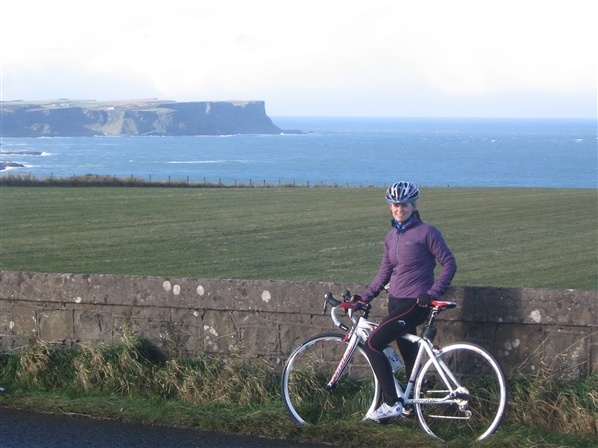 Next up for Andrea and her Belles is hopefully the Race Across America! One of the most respected and longest running endurance sports events in the world, the RAAM inlcudes 3000 miles of cycling across 12 states, 88 counties and 350 communities ascending over 170,000 vertical feet.